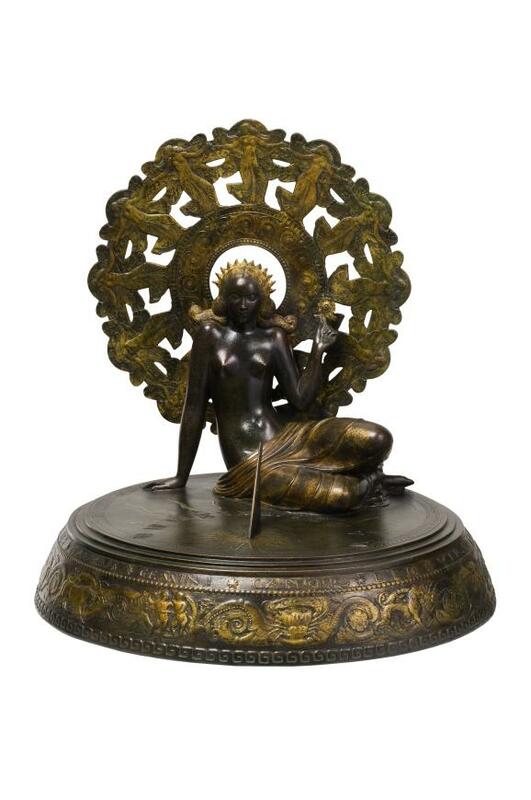 Paul Manship’s significance as one of America’s foremost sculptors of the early twentieth century lay in his ability to combine a modernist approach to form within the bounds of figurative art. The variety of his subjects, the infinite beauty of his lines and the pure delight he found in the human figure all contribute to his outstanding reputation. Manship was born in 1885 in St. Paul, Minnesota, where he studied painting and sculpture in the evenings at the St. Paul Institute between 1892 and 1903. He spent two years as a free lance designer and illustrator before moving to New York City in 1905. At the Art Students League in New York, Manship came under the tutelage of George Bridgman and Jo Davidson, both specialists in anatomy and portrait sculpture. It was about this time the young Manship assisted the distinguished older sculptor, Solon Borglum, who was doing large-scale equestrian monuments at the time. His first body of work, which included Horses in a Storm of 1906, reflects Borglum’s impressionistic style. 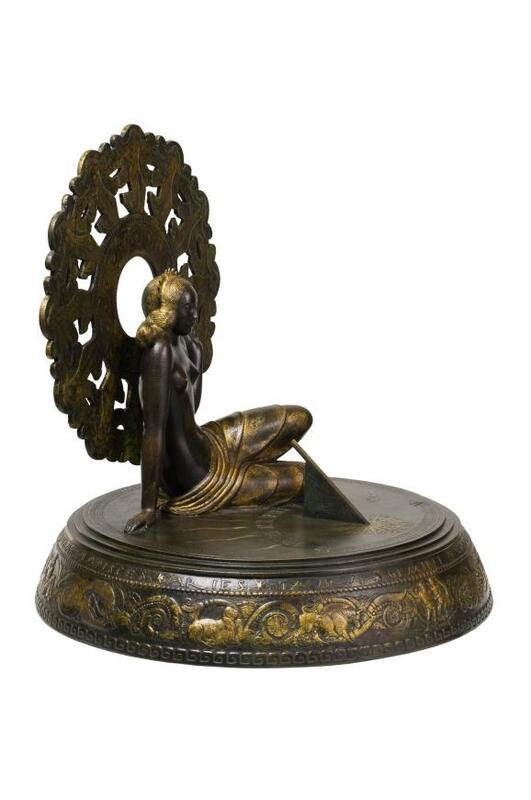 In 1906, Manship took life-modeling classes with Charles Grafly at the Pennsylvania Academy of the Fine Arts, and in 1908 he worked in the studio of the French-trained, Viennese-born Isidore Konti, who fostered his interest in classical sculpture. Manship’s official recognition came early when, in 1909, he won the American Prix de Rome, which provided a studio and an allowance, which he used for travel throughout Italy and Greece. He drew extensively on the rich traditions embodied in Minoan friezes, archaic Greek statues, ancient Egyptian and Assyrian reliefs, as well as Italian Renaissance bronzes. When he returned to the United States in 1912, Manship brought with him a number of carefully finished pieces, including his Mask of Silenus, Lyric Muse and Centaur and Dryad, all of which drew for their inspiration on archaic sources but also offered collectors a pseudo-modernism in their silhouetted forms, smoothly finished surfaces and stylized features. Manship’s success was immediate. At the exhibition held by the Architectural League in 1913 and at the National Academy Design annual of the same year, he became the newest prodigy on the American art scene. His next personal triumph came in 1916 with his one-man exhibition at the Berlin Photographic Gallery in New York City, at which the stellar attraction was his newly created Dancer and Gazelles, a rhythmic creation that captured the spirit of Indian art with a free-flowing grace that found parallels in the advanced choreography of Isadora Duncan and the exotic costumes of Leon Bakst, designed for the Ballet Russe. Honors continued to be heaped upon Paul Manship as his position as the leader of the younger men of the academic group became more evident. IN 1918, the Metropolitan Museum of Art honored him by selecting him to design the J.P.Morgan Memorial. The American Institute of Architects presented him with its fold medal in 1921 and in 1923 he was appointed the annual professor of sculpture at the American Academy in Rome. Architects soon discovered that Manship’s streamlined forms were well suited to modern buildings and city plazas. His earliest architectural commission was in 1914 for four bronze reliefs of the Elements to adorn the façade of the Western Union Building, New York. Later, he would produce the famous gilded figure of the mythical fire-giver, Prometheus at Rockefeller Center. By far his most demanding project, however, came in 1926 with the commission for the Paul Rainey Memorial Gateway, a melange of twenty different species of birds and animals at the New York Zoological Park in the Bronx. Over the length of his career, Manship produced more than seven hundred works. To handle the many orders that came to him in the 1920s and 1930s, he employed a number of assistants, including Gaston Lachaise. Several studios were maintained, not only in New York but later, in Lanesville, Massachusetts, in Paris and Rome. Manship’s fame was solidified with a retrospective exhibition at the Tate Gallery in London in 1935 and, later, one-man shows at the Corcoran Gallery of Art in 1937 and the National Institute of Arts and Letters in 1945. His work is represented in numerous collections both here and abroad, among them the Minnesota Museum of Art, St. Paul, the Metropolitan Museum of Art, the Corcoran Gallery of Art, Washington, D.C., The Boston Museum of Fine arts, the Art Institute of Chicago, the Philadelphia Museum of Art, the Pennsylvania Academy of Fine Arts in many other public and private collections. 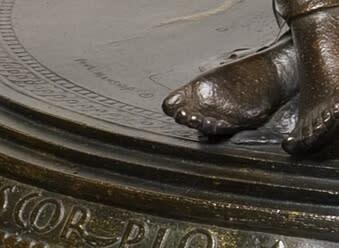 Manship executed a number of sundials during his artistic career but Day and the Hours is potentially his earliest endeavor on this front. It was executed in 1916, the same year he created Dancer and Gazelles and the two female forms featured in these works are almost identical and reflect the rich East Indian influence that was running through his work. In Day and the Hours it has been suggested that the female form is drawn off the idea of a Bodhisattva figure of wisdom and enlightenment in the Hindu religion. 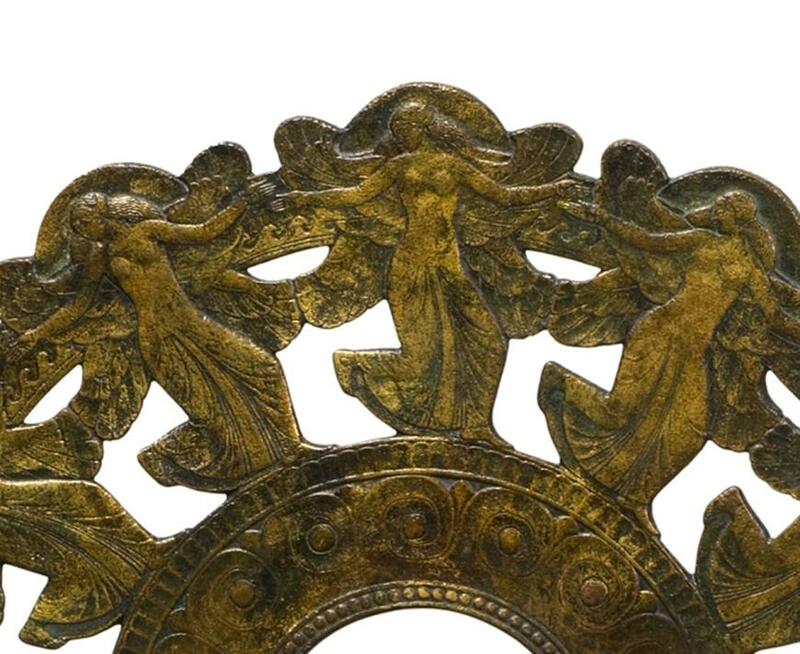 The peacock fan motif behind this figure features low relief, dancing figures which Manship loved to use from classical Greek vases that he admired. 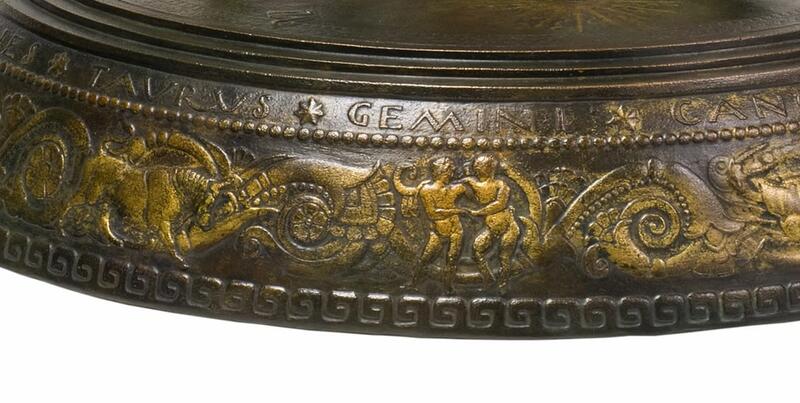 Many of the elements in this work show up later and throughout his career in his most successful works such as The Celestial Sphere which features many of the same zodiac signs and symbols used on the base of this sundial. In the Roman Bronze ledger it appears that this work may have been cast up to eight times at that foundry although we have only been able to locate one cast in a collection in Florida which has a gilt patina which may or may not be the original patina. One cast in a California private Collection collection has a completely weathered and verdigris surface and is in poor condition. This is a rare model that does not appear often in the market. 86 | DAY AND THE HOURS – SUNDIAL. 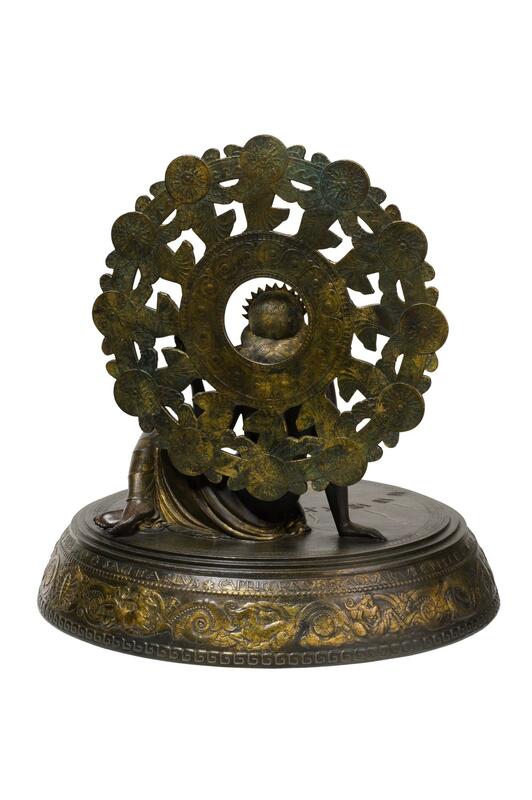 Before a vertical, wheel-like nimbus decorated with dancing figures in low relief sits a partly draped figure of a woman. 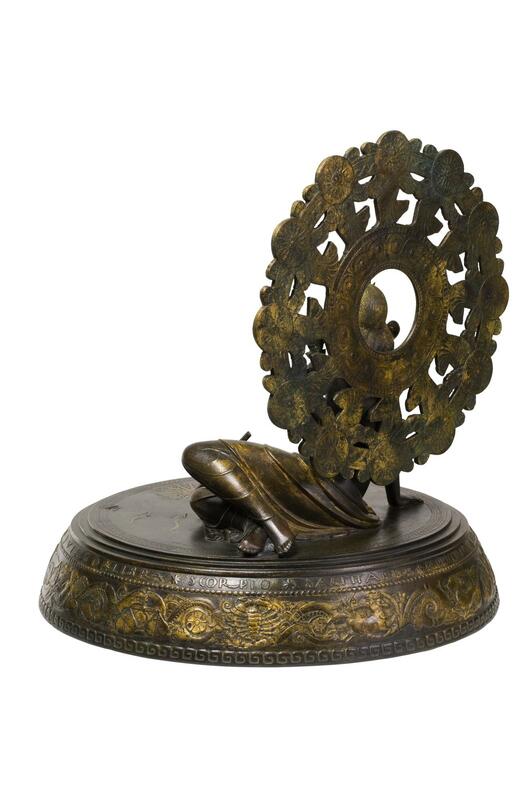 Her right hand is on the ground; her left holds up a flower. Her gaze is up on the dial. The base is decorated with the Signs of the Zodiac in low relief. 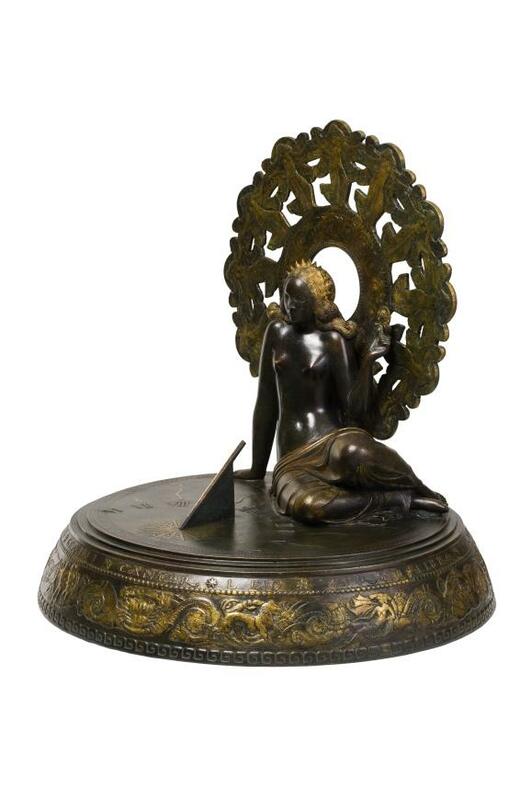 Manship quite frankly used elements from Indian sculpture in the creation of this exotic sundial, yet, as the critic Royal Cortissoz remarked, he used them with such a sure hand that the work is entirely his own. 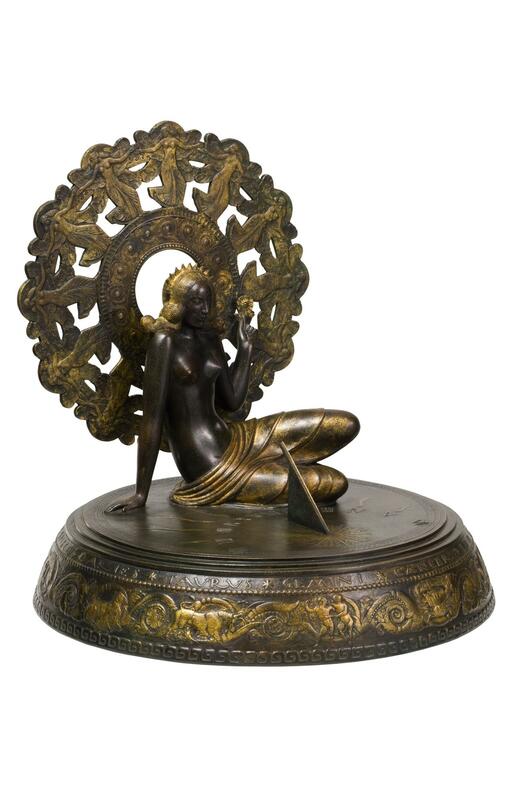 Guilded bronze sundial. Height 1 ft. 8 ½ in. Base: 1 ft. 6 in. diameter. 1916. Ten copies. Illustrated: Vitry, Pl. 10. St. Louis, Collection of J. Lionberger Davis.